xvi, 175 p. ; 21 cm. "With a career spanning three decades and transitiong seamlessly between the fields of sports, entertainment, politics, and even cooking and crafts, Phyllis George has lived a lifetime of risk-taking, pioneering, and success. Now, she shares the 10 essential lessons of her vast and varied experience-lessons that will give you the strength to take the first step toward the life you want." -- dust jacket. 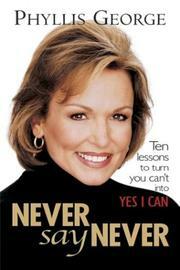 Never say never : ten lessons to turn you can&apos;t into yes I can / Phyllis George. 100 Personl Name ME 1 $a Personal name George, Phyllis. $c Statement of responsibility Phyllis George. 505 ContentsNote 0 $a Formatted contents note Say yes to yourself -- Embrace change as your friend -- Be a risk taker -- Find a void and fill it -- Trust your instincts -- Keep your options open -- Feel the power of being nice -- Life isn&apos;t perfect -- Keep your perspective -- Learn to laugh at yourself. 520 Summary Etc. $a Summary, etc. note "With a career spanning three decades and transitiong seamlessly between the fields of sports, entertainment, politics, and even cooking and crafts, Phyllis George has lived a lifetime of risk-taking, pioneering, and success. Now, she shares the 10 essential lessons of her vast and varied experience-lessons that will give you the strength to take the first step toward the life you want." -- dust jacket.